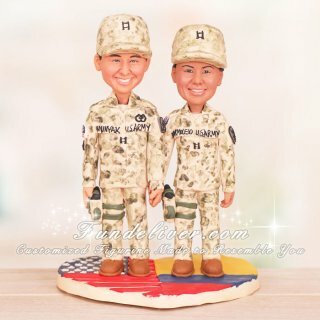 This is a completely customized US Army Captain wedding cake topper ordered by one of our customers. The bride is originally from Colombia and the groom is American, so they had the idea of using their national flags for the base in a heart shape with her on the Colombia side and him on the US side. 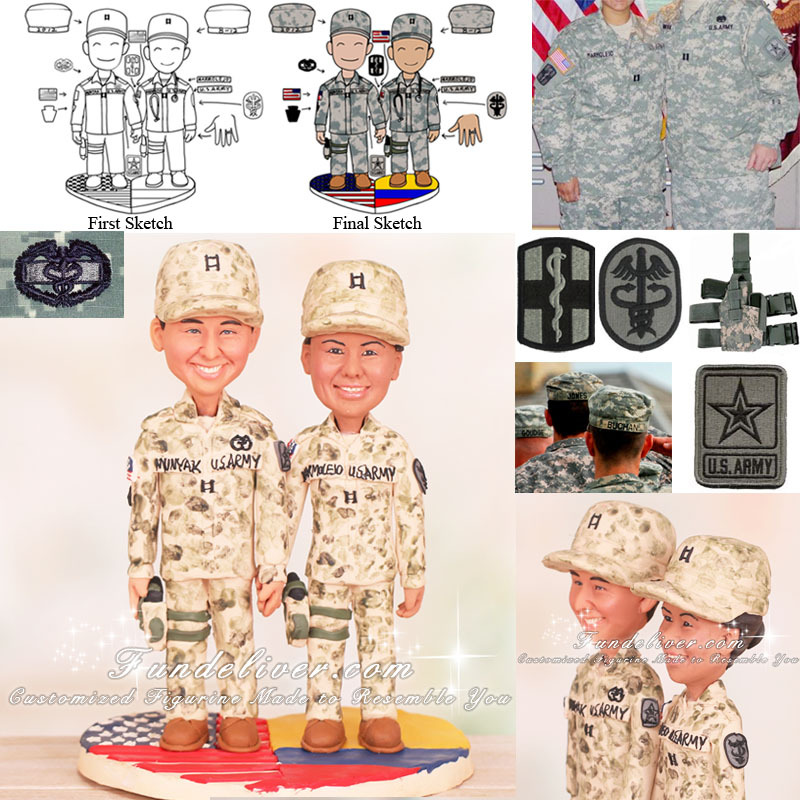 They are both Captains in the US Army, so they would like their figurine to be in ACU Digital Army Uniform with their rank on the chest and hat. They would also like to have handguns but no rifles. She is a Nurse, so she wants to be wearing a stethoscope. Her last name is MARMOLEJO and his last name in MUNYAK, they want those on the right side of the chest and "US ARMY" on the left. They also had the idea of putting the Date 08-12-2012 on the back of the hats by putting "08-12" on the bride’s hat and "2012" on the groom’s hat. There is an Army Medical Command (MEDCOM) patch on her left arm and 1st Medical Brigade on her right. For him, there is a HQDA patch on his left arm and 28th patch on his right. Also he has a Combat Medical Badge above his "US Army" on the left side of his uniform.